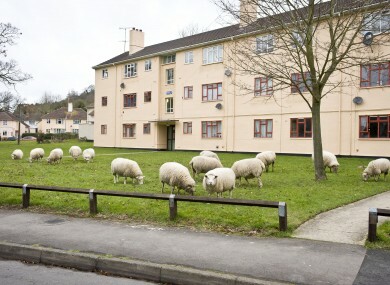 Sheep graze in an urban environment in the village of Matson, where the local farmer allows the sheep to permanently graze among flats and houses in the quiet English village. EVERY DAY, TheJournal.ie brings you a round-up of all the day’s main news as well as the bits and pieces that you may have missed. Pharmaceutical company Eli Lilly is creating as many as 200 highly-skilled jobs in Cork as part of a multi-million euro investment into its campus in Kinsale, it was announced today. But there have been 60 job losses in Dublin after the printing firm Wood Printcraft announced it had gone into receivership. Staff are said to be devastated by the news. Figures have shown that 19 managers of city and county councils have received payments of over €1.15 million on top of their regular pension lump sums since the turn of the century. Here’s the full details of the payments. The European Commission has told Ireland to address a court ruling which says that health insurer VHI must be regulated by the Central Bank, a requirement of most insurers which VHI had been exempted from since the 1970s. Sinead O’Carroll has the details. A cruise ship with more than 1,000 people on board is without power in the Indian Ocean following a fire on board.The ship is part of the same fleet as the Costa Concordia which capsized off the Italian cost in January. Singer Charlotte Church has said she was left feeling “sickened and disgusted” after learning that her phone had been hacked by the News of The World. She was speaking after receiving a £600,000 (€710,000) settlement from the defunct paper’s publishers News International. Meanwhile, the Leveson inquiry into media ethics in the UK today heard from the police chief leading the investigation into phone hacking who said that the Sun newspaper had a culture of illegal payments to sources. Wikileaks – whose founder Julian Assange is pictured above at a press conference today – has begun to release some five million emails that were obtained from a private intelligence firm, Stratfor, by the hacking collective Anonymous last year. It is claimed the emails reveal massive corruption and bribery in the international intelligence industry. As the Germany parliament voted to back a second rescue package for Greece this evening, the idea that the debt stricken country should leave the euro was mooted by one minister today. That’s prompted us to ask should Greece be encouraged to leave the euro and so far over 60 per cent of you think so. Speaking of Germany, its chancellor Angela Merkel has enough on her plate without getting soaked in beer but that’s exactly what happened to her last week as she addressed a meeting of her party. Watch the unfortunate event here. Former president Mary Robinson has told the UN that it needs to push ahead with plans to investigate alleged war crimes in Sri Lanka during the country’s brutal civil war. Do you like a good ham sandwich? Apparently 79 per cent of Irish people believe the humble hambo (geddit?) forms “a key part” of “important family gatherings”. Impressionist Mario Rosenstock is fronting Bord Bia’s latest campaign. If you’re waiting until the Oscar highlights are shown on Irish television later then stop reading now. Otherwise check out the top eight most memorable moments from last night’s awards ceremony in LA. The Artist was the big winner but there was also some Irish success and Sascha Baron Cohen was up to his usual antics.